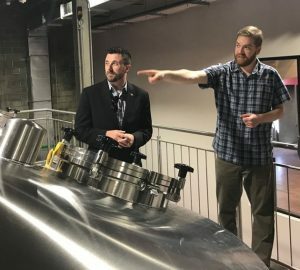 Union Craft Brewing co-founder and owner Adam Benesch leads state officials on a tour of the new Union Collective brewery. As the company’s name implies, Union Craft Brewing likes to bring people and things together. After five years powered by a great product and passionate customers, Union faced a happy dilemma. They had outgrown their facility in the Woodberry neighborhood, the first production brewery opened in Baltimore in more than 30 years. Less than a mile away in the Medfield community, the owners found what seemed to be an ideal location, a 140,000-square-foot warehouse near both the light rail and Interstate 83, but there was an immediate issue. The facility was bigger than what they needed. So, Union did what their name implies. They started bringing people together, reaching out to like-minded local businesses that were looking to expand, to fill the repurposed warehouse and form Union Collective, a modern-day manufacturing center anchored by Union’s brewery and taproom. Once the vision for Union Collective was clear, Union Craft needed to secure financing to make it happen. That’s when they turned to Neighborhood BusinessWorks, a state small business lending program administered by the Maryland Department of Housing and Community Development. Benesch learned about the program from Seawall Development, Union’s neighbor at their original location and developer of the new space. Seawall had successfully partnered with the department for numerous revitalization and redevelopment projects during the past decade, particularly in central Baltimore. Through Neighborhood BusinessWorks, Union Collective received a $500,000 loan, but more assistance was needed to support the nearly $16 million project. “We knew Union Collective looked to be a huge, transformative project that would benefit Baltimore and Maryland, so we figured out a new way to secure additional capital for its development,” says John Maneval, Deputy Director of the department’s Community Development Administration. The loan guarantee bolstered the investors’ confidence in Benesch’s vision and was critical in securing the necessary capital to finance Union Collective. According to David and Laura Alima, married co-owners of the celebrated local ice cream manufacturer the Charmery, joining Union Collective fit perfectly with their need to increase production beyond their current capacity at the Charmery’s storefront in Baltimore’s Hampden neighborhood. “Moving into Union Collective really defines the next step for our business,” says Laura. A door is painted at the Union Collective building in the Woodberry neighborhoods in Baltimore. Most businesses in the collective will have production on-site, so visitors can see firsthand how their products are made. All of the Union Collective members share Benesch’s vision for reinvigorating manufacturing in Baltimore with a thoughtful, civic-minded approach that supports the local community. It’s an optimistic sentiment echoed by other Union Collective members. During Governor Larry Hogan’s first term, Neighborhood BusinessWorks has provided more than $45 million for 129 projects statewide, including more than $34 million and 76 projects in Baltimore. The department is aggressively working to expand its small business lending and Maneval believes the new loan guarantee mechanism developed to secure investment for Union Collective will become a powerful new financing tool to support revitalization and redevelopment throughout Maryland. For more information about Neighborhood BusinessWorks and other small business assistance, visit: http://dhcd.maryland.gov/Business/. Union Collective is a community-minded group of businesses redeveloping an industrial warehouse to create a dynamic new manufacturing hub and tourist destination in Baltimore. Who are they? 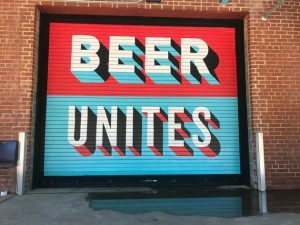 Union Craft Brewing: Expanding into a new and larger space, Union’s production brewery and gigantic taproom will serve as an anchor for the new collective space. Baltimore Spirits Company: Concocting new and expressive spirits with traditional old world distilling methods including their flagship whiskey, Baltimore Epoch Rye. The Charmery: Creators and manufacturers of super-premium ice cream featuring unique flavors and locally-sourced ingredients. Earth Treks: An indoor rock climbing and fitness center for exercise and entertainment. Huckle’s Gourmet Foods: Crafters of all-natural gourmet hot sauces, condiments and other wonderful foods. Vent Coffee: Artful and passionate roasters that support socially-conscious coffee growing and importation. Well Crafted Kitchen: Promoting community and connection by serving locally inspired, wood-fired pizza in the taproom.